The first page both sides is finished so now onto the next one. I have not yet decided how they will all end up - one of life's little surprises maybe. The vacuum cleaner came back rather grubbier for wear with a shortened long thing - Ian's pride and joy. I cleaned it - he shall fix it but we got lots of bags for it. In case you have been worrying that I would fail in my new year resolution, the Feb newsletter is all ready to send out tomorrow. I have instigated specials just for newsletter readers (in addition to the ones on our website). Judging from the response this month, it was a good idea. You have to sign up on our website to receive it though. BBQ tonight - chicken tandoori Dale style. This wonderful book arrived yesterday - a super collection for my research and ideas for my work. I am going to use them for my Shiva work - I have an article which will be in Machine Embroidery (and textile art) in the June on using them and I am making a pile of tiny cushions for the article. Started ages ago but not finished. Other things got in the way. Whoops - I forgot to push the publish post button on Wed so here we are on Thursday - I will be back! busy day today - it has dawned on me that i have to start packaging stuff for Melbourne quilt show so this morning was Romeo morning. Then we took ourselves off to Atonement - what a wonderful movie - Great photography and acting and the story. Well worth a visit. Back home by 9.30 to cook our bbq - a lovely evening - not too hot at all. This is page one of my book - not completed as I plan to cut some holes to fill with images but I am underway. 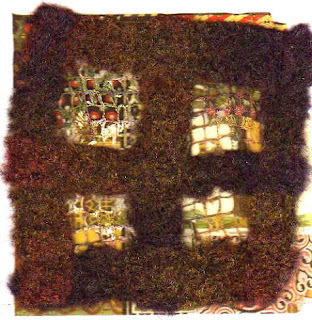 This is embellished fibres on scrim which has been woven - see the holes in readiness for what might lay under there. Thank you for all the nice comments - I enjoy writing my blog. It's like the diary I started each January 1st and never got very far. It helps to keep me on my toes . 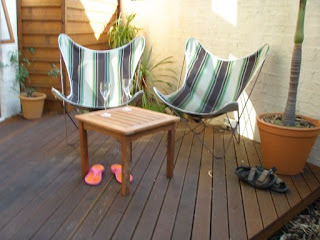 Here we are - well we are not but our champagne glasses , chairs and shoes are - all at the ready for our Australia Day relax - the weather is hot and humid (sorry to sound like a jammed vinyl record) and quite tiring so by the end of the day we are both quite worn out. But we had a lovely relaxing night and watched most of the fireworks standing up at this very spot. 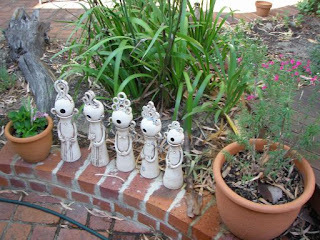 Our choir in the garden - at the ready. 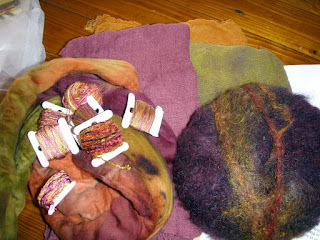 In Melbourne for my embellisher workshop I had made some pieces with wool fibre worked on scrim and I cut them up and wove the strips. This is it on my table with my Marrakech stuff surrounding. 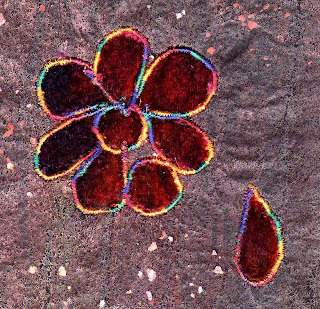 Back home I have flower stitched on the surface and added some hand stitch - here is a close up. Incidentally, if you have a flower stitcher and you want to share what sort of sewing machine you have, I would love to hear from you. Then I can add the info to our website because lots of people ask me and I don't know all the machines they work on. 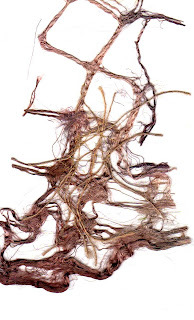 Starting work on my Marakkech book - collecting together all my fibres and scrim - this is for the book cover. 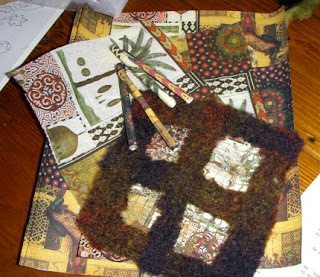 and here are the ingredients for one set of pages - including beads made from my Marrakesh serviettes. At last I am underway - it takes me ages to plan, sort, gather, print, then stitch, paint, cut, layer etc etc. Now Ian beckons as we are off to Spaghi for dinner. Happy Australia Day all you Australians. I walked to the shops to get the usual stuff this morning and staggered home. i.e. still hot. but we have had a pretty relaxing day and are preparing for our bbq - no Aussie lamb sorry. We are cooking marinated chicken thighs followed by veal, asparagus wrapped in prosciutto, balsamic tomatoes and klipfer potatoes with a good red. I have taken some photos but they may have to wait until tomorrow. I got this wonderful merino/mohair wool yesterday (a huge box arriving in the midst of the new dresser being exchanged/crockery etc everywhere/a large delivery of wool and silk) - who needs all of this. 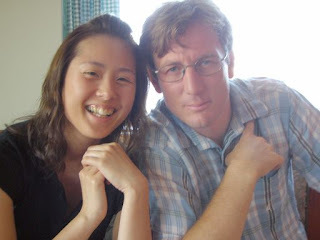 However we borrowed Bruce and Kazuko's vacuum cleaner and resigned ourselves to the fact that we need to buy a new one (Grant has been using ours to clean the ceiling in his house and goodness knows what else) so the kitchen is nearly back to semblance. 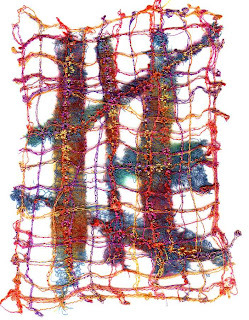 Anyway this wool is fabulous - I got in 5 colours - called Fusion - I knitted it/embellished it/cut it up and sort of open wove it/embellished it again and voila - I have a frame for one of my Marrakech postcards (not finished). Progress though. This is an image transfer of one of Ian's photos which has come up well. More work on this tomorrow. 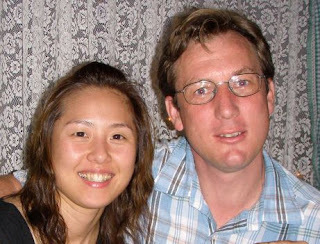 Today is my 500th posting, I have had over 98,000 visitors since Dec 2006 (when I started Neoworx) from 99 countries. I do hope it is worth your while to read my rambles. And yes, in answer to someone somewhere, I do proofread before I hit the publish button and then I do go back and correct the errors. it's still horrible hot and sticky. Last night we went to the Sommerville outdoor movies at UWA with Eva and Malachy - it was a lovely evening and good for a picnic. The film was rather long and drawn out and we got lost but of course the good guys won in the end as they usually do. The Bead Unique magazine I ordered from US finally arrived today - only nearly 3 months. It cost me twice as much for postage as for the magazine - I presume it came by slow mule swimming. 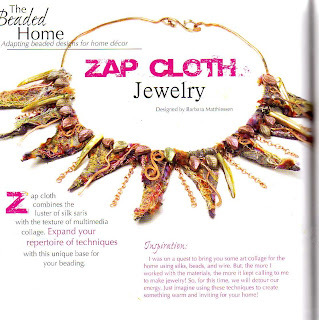 I wanted to see the article by Barbara Matthiesson using Zap Cloth since it is our very own product. It is really interesting to see what other people have done with it - I do have a good set of notes to go with each package. 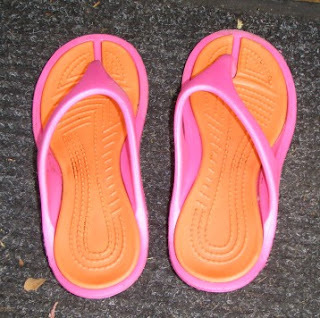 These are the Croc Thongs - well more like Rivers Jandals which I bought in Melbourne for $20. Love the colour and they are very comfy. I have been playing around with some transferring of images but I will keep those for tomorrow. Getting some nice faded and worn sort of results. I think we will have a day off tomorrow from work - it is Australia Day and maybe we will go for a swim. The new dresser we had delivered for the kitchen had to be replaced as it was broken and the replacement came today. While we wait for Grant to re-emerge with our vacuum cleaner, we have crockery etc all over the kitchen. But a bbq tonight although it is pretty hot out there. I haven't got my copy yet but the latest Machine Embroidery (and textile art) is out with my article on the flower stitcher. I have had lots of orders - that's how I know. I am waiting to see what the article looks like. 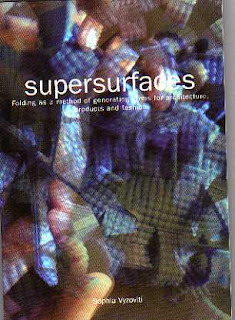 And you will also be able to see my studio in the Cloth Paper Scissors Studio edition due out in April. I have no idea in what capacity though. It's horrible and hot and sticky and tomorrow will be 38 - I really don't like this weather. 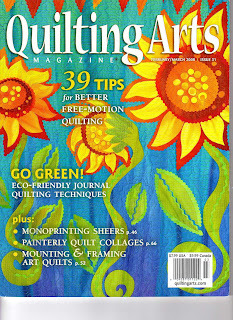 I didn't get anything much done in the studio today as the Quilting Arts 31 arrived - without incidence - this is a first for quite a considerable time and I have been in a state of shock.... We have managed to get most of them out and will finish off tomorrow. You feel like there's a catch after all the trouble we have had with the past number of shipments. I haven't had time to read it as yet but I expect it will be good as usual. Very bright colour - highly suitable for the way I feel today. I also got this lovely book in the mail - it is a novel but very interesting inside - I am looking forward to reading it. 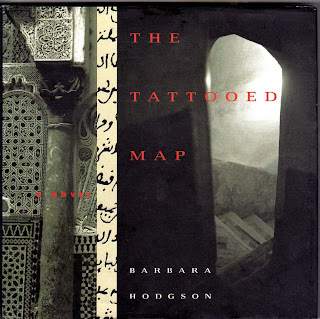 It has all manner of wonderful pics and drawings and maps - in North Africa including of course, Marrakesh. 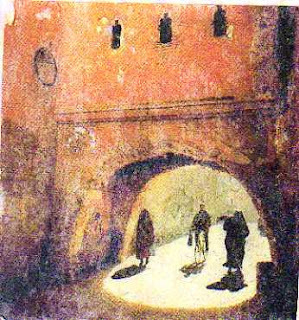 The other lovely surprise I got when I got home from Melbourne was that Lynda had sent me the video of Gormenghast - thanks so much - we will enjoy seeing the remainder - it has been a saga and a half. Got back to a couple of lovely new books - well a few more than that but these are both lovely. 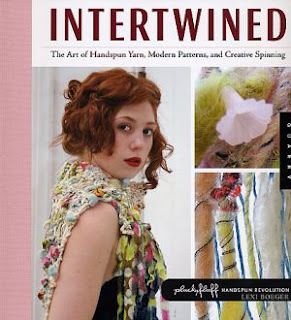 First one is Intertwined - I love all the super textured yarns and when I get onto my new spinning wheel (when it is cooler) I shall be trying lots of these ideas. Everything unpacked and away and maybe studio work tomorrow - I have started on my Marrakesh book Robyn will be pleased to hear. Just a quick call in from Melbourne where I am staying with Mandy who is he most wonderful host and I am rather spoilt and being very lazy. 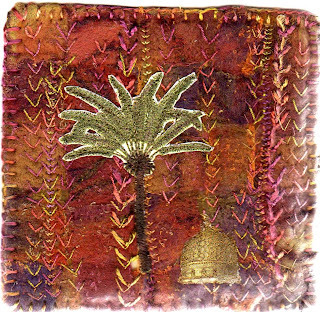 I have just finished my first 2 day workshop - Using the Embellisher (I got the workshops back to front and thought I was doing this one tomorrow..) - had a lovely class and they spent time learning quite a lot about their embellishers and what they could do (or not). A few broken needles but lots of great work. Last night we went to Melanie's for fish and chips and it was really great to catch up with so many of the Melbourne 'girls' - they are a wonderful bunch and I always feel I have known them for ever. My lazy day today and I am at the computer while Mandy is cooking breakfast - how spoilt can one be? Well not quite but it is late in the evening and the first of 3 suitcases is not actually full yet. This is the case for my Fragments class on Wed and Thursday and I forgot to include a number of things in the requirements list which means I have had to rethink a bit about what I am doing. I should be right in the morning..... Then there are the other 2 suitcases and a little pile of orders which came in this evening which I will do so as not to leave stacks for Ian. I will be back on Sunday night. Actually I think I should be panicking but I gave that up years ago. Maggie mentioned transferring images onto webbing on her blog so of course I had to try that. I scanned (my computer is behaving like a dream with its new ram - oh so fast) a couple of postcards from Marrakech and printed them. They were quite grainy but I managed to transfer them onto the webbing - first one very faint (the backing was some moonshadow sprayed cocoon strippings and maybe they were too dark) but the second one amazingly good (I used white polycotton). Then I scanned a photo Ian took and that was excellent. Thanks for that Maggie - I shall explore the idea further. I am a very lazy transfer person - I usually soak tissutex in Inkjetset and that does the trick for me although my new Epson scanner does not like Tissutex and I have to use Ian's older scanner. Means a bit of mucking around. But at least I am busy doing some prep work for my Marrakech postcards so you good people in Wanaka I hope will enjoy seeing them. Janet mentioned this book in the HH Module 2 notes (no - that does not mean I have finished module 1 but I sneakily read ahead). The grass is always greener. Anyway this little gem arrived today. 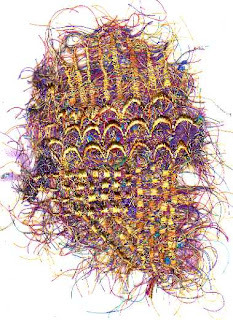 It is full of hand-folded, twisted, wound and woven forms. Extremely valuable. 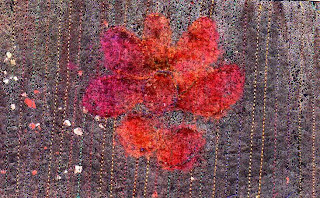 I am still thinking about velvet applique but once I have mastered something on this subject I shall be ready to move on. Susan - thank you for your comments on Cennini - and you are amazingly talented. I have only ever plodded on playing - nothing heavily intellectual at all. I shall visit you and see what you are up to. 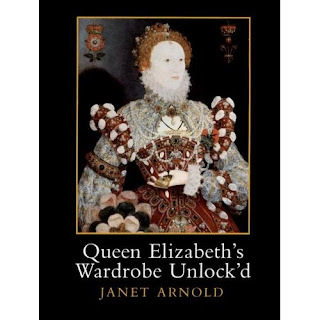 The book is really quite fascinating and of course they didn't have access to all the stuff around today - look at acrylics for a start - but the fact that they had to create stuff in order to be able to use it, makes it so much more meaningful. We get so used to just buying this and that and not thinking about where it comes from. There are, apparently, all these kids in the world who think milk comes from cartons, chips from Maccas etc etc. 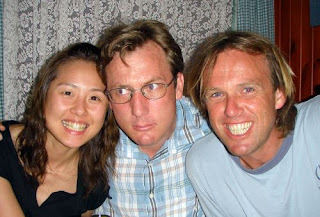 The thing about using a digital camera is that you can simply delete pics you don't like. 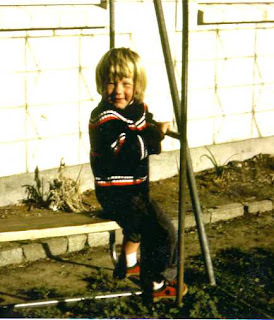 In the latter part of her life some of the photos my mother sent me had heads chopped off and were full of people I had never seen. Never mind. Last night we went to Keating the Musical - a wonderful satirical black comedy which we thoroughly enjoyed. 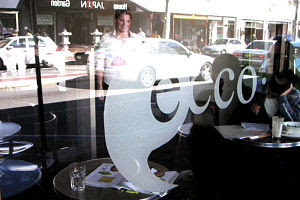 We caught the train to Subiaco and had a super meal at Ecco, a very busy pizzeria on Rokeby road. Worth another visit for sure. I am still working away on preparation for my workshops in Melbourne but have allowed myself to get sidetracked working on my Marrakech Postcards - they will be a series to go to Wanaka for March. Very sad and sobering news for us all was the death of Sir Edmund Hilary - a NZ living treasure and okay he was 88 and not well but you kind of expected him to go on for ever. Such a modest, generous man who achieved such fame and all without the hype we seem to be engulfed in today. I think it all shows there is a change and we will never see the likes of him again. Tonight we are off to San Marco with the family. I have been collecting my stuff for my workshops in Melbourne next week and I pulled out this book I bought a few years back when I only thought I might be interested. 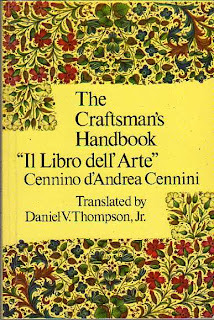 It is a guide to methods of painting written in the 15th century written by Cennini and translated into English. It's packed with all manner of fascinating information. I shall take it to read in the plane as I dare not sit around reading it right now - I am supposed to be making samples, collecting and sorting and then trying to work out how to get it all into my 3 suitcases. It's a beautiful day today - not too hot but a fresh sea breeze. Tonight we are off to Keating the Musical. By all accounts it should be good. Tomorrow we are going to try the trip to Fremantle again for the outdoor chairs, hopefully before the shop closes this time. Grant's house is coming along well - I will take the camera with me tomorrow. 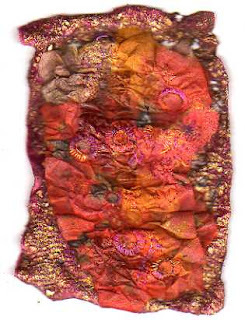 The weather is wonderful- my computer is working like a fast dream - I am about to do something with velvet applique - I am working on samples for my workshop in Melbourne next week. That must be enough activity for today. The weather is so much nicer today and this evening we sat outside for a bbq and it was almost cool! I went to the hairdresser today to be refuchsiaed (is there such a word?) and I found this book at Oxford Books in Leederville. A bit of a find for all of us scavengers. I remember the water sellers in Marrakech - probably not doing so well at all in this day of bottled water but they were selling water to the locals and very colourful too. 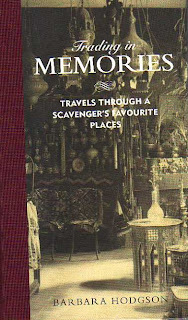 I shall enjoy reading it - lots of places I haven't been to but the chapter on the Grand Bazaar in Istanbul brought back plenty of memories. 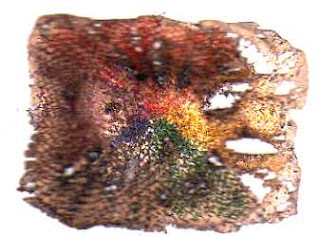 I stitched a colourwheel, coloured it in walnut ink and herbal tea (smells nice), ran it under the embellisher and attacked it with the cheese grater and then the heat gun but do you think it would distress nicely - no. My laptop finally got its new ram today - yeah!!! 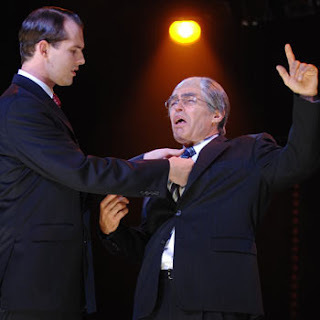 I can scan, I can bring up Generations without a drama, pagemaker is operating again. I am back in action at last. Tomorrow I shall back everything up. It's like having your baby back home - it has never been so fast and efficient. 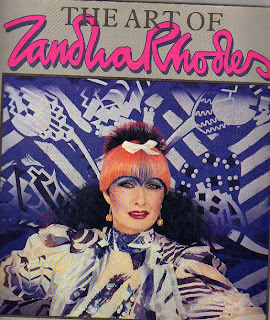 Mags was talking about Zandra Rhodes on her blog and I went searching for my The Art of Zandra Rhodes from the 80s - I thought I had lost it but found it hidden away. This has been one of my most inspirational books. 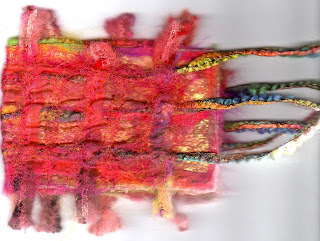 I have been playing with colour and stitch in between trying to keep cool. 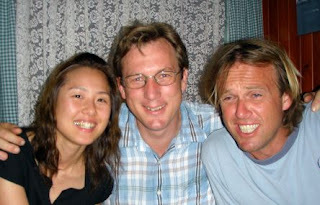 It is very humid and I slept with the window open and we think every sandfly in Perth came to visit looking at all the blood on our sheets. 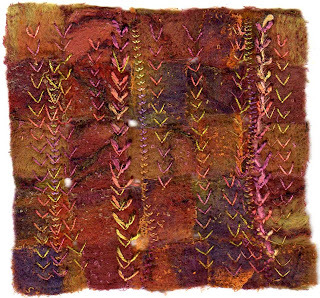 This one is using a variegated thread - Indian Splendour - which has 5 very strong colours. All free stitching with dogs down. 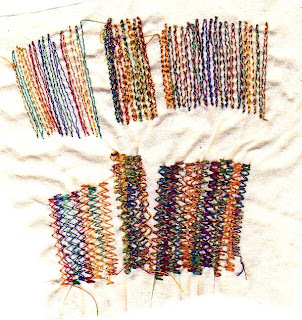 The top row left to right - 1- 1 thread in top and bottom 2 - 3 threads in top - 2 var and 1 gold 3 - 2 variegateds. Bottom row - free zigzag - 1 - 1 thread in top 2 - 2 var and 1 gold in top through 1 needle - 3- 2 threads in top. You can see the greater depth of colour when you use 2 variegateds through the top needle and adding gold gives that extra special extra. 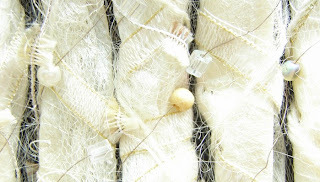 1 - 1 thread in top and straight stitch, 2- 2 threads in top 3 - 2 threads plus gold through needle. 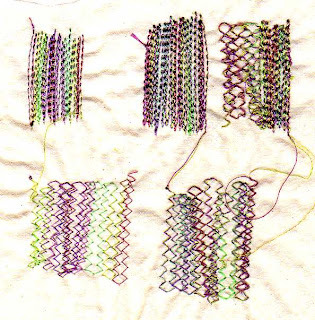 Bottom row - zig zag 1 - 1 thread in top, 2- 2 threads in top. Again - it gives so much more depth of colour. Playing with threads is a very useful exercise. Since I design all of our variegated threads I spend ages testing combinations and using them this way. I really enjoy as it adds to the palette. Tonight we went to Gogos for dinner. He is hoping the cricket will be on in Perth as he is cricket mad and is doing the catering. The dummie - well Maggie - she was nice but I did bring the dummie back not the little old lady. Penny - I do have several dummies including Dolly Pardon but this one is a perfect shape. Hello Connie- thanks for your lovely words. Our server has been having a lot of problems today as we haven't been able to receive mail for most of the day - at least it kept the spammers away but only for a short while. If you emailed us and it bounced do try again - we seem to be okay again now. Yesterday was a particularly non-event day. We decided to go to East/West in Fremantle to get some more chairs for outdoors but when we got there it was closed. Then Ian had a vision of someone lighting a match and throwing it into the front garden where there is the dry tree debris, so he did a fast U turn and came back home. On the way we encountered all the traffic coming back from their holidays in Mandurah, Rockingham, Margaret River and so on. Plus we didn't get to see a train running on the new train line so all in all, the outing was a dead loss. The good thing is that the front garden has all been cleaned up of debris and I made a curry for dinner which was very nice. From my point of view, I stitched a pile of colour charts in different combos without realising that I had orange and yellow the wrong way around and it really does affect the end result. 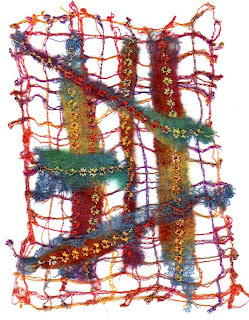 I have pulled out another favourite of mine - Machine Embroidery Stitched Techniques - Val C-H and Pam Watts. 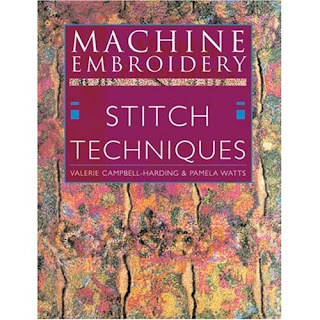 This was the first machine embroidery book I ever bought and I taught myself from it. I still think it is one of the most useful books I have. It's out of print but I am sure you can find it on Amazon. There is an exceptionally good chapter on colours and colour combos and I haven't really seen anyone else writing on colours before or since. 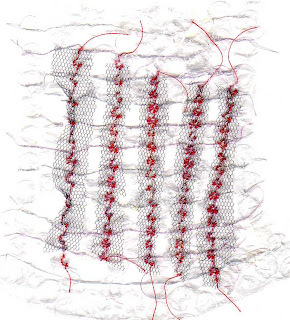 The book works through stitches starting with running stitch and every time I pull it out I find a new piece of info. I haven't been further inspired yet with my velvet applique but it will come to me. In the meantime playing with colour never goes astray. Went for a walk to see the progress on Grant's house - it is looking so much better - will be fabulous when it is finished. The plasterer was busy indoors and Grant was dumping rubble. Walked up Beaufort Street to get the groceries etc and met Ian for coffee at Lincolns. This afternoon I made a couple of pages for yesterday's book - embellisher and hand stitch. Back to real work tomorrow. Last night we watched The World's Fastest Indian - really good. Gormenghast tonight I hope. Tomorrow I will fix my header but interestingly on Internet Explorer it is tiny but on Firefox enormous. The weather has improved in that the temperature has gone down and the magical sea breeze has arrived but it is still muggy - amazingly in the eastern side of OZ they are having floods. Pam told us last night that she thought Yeppoon was one of the best places on the east coast - I know we have lots of customers from Yeppoon (how could you forget the name?) 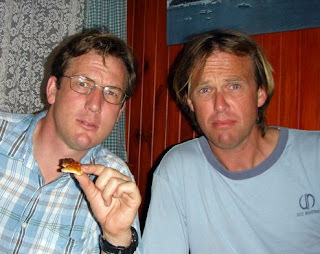 but I don't know if any read my blog - anyway there you go - maybe we will have to visit one day. Today - Cloth Paper Scissors in - Cloth Paper Scissors out - more on way. I haven't been further inspired with the velvet applique yet - still thinking and waiting for the magical inspiration, but this is a little book I am making for my workshop in Melbourne - the embellisher workshop. If you want to see the progress of Grant's house (the one which the tenants tried to burn down earlier in the year and the squatter haven recently), go check his blog on the right to see the progress. It will be magnificent when it is finished. I thought I would play around with my header - lost the old one which I do like and may have to rescan it but this one is enormous. It addles your brain when it is muggy and hot but you just plod on gently. I have stitching colour wheels today - yes Playways people - even I stitch colour wheels! No distressing of them yet though - only me who is heat distressed. 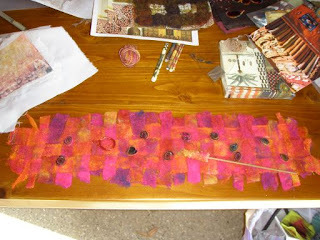 Started on velvet applique - very base to start while I get inspired with some ideas but I have corded around the shapes. Then I stitched some more and stitched straight lines over the top - that always improves something but then I ran it under the embellisher and now we are talking a bit of distressing. 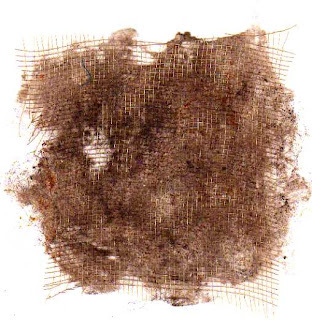 Distressing is not only when you are hot and bothered but also what happens to your clothing after many years. This is some detail from my Virgin Bride dress whichI have always been fond of. 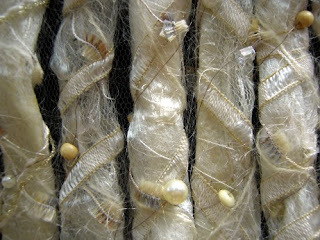 Lots of silk paper making, text stitching, cutting, wrapping and hand stitching on - of course - bridal tuile. Here is it on the dummy I borrowed last week. 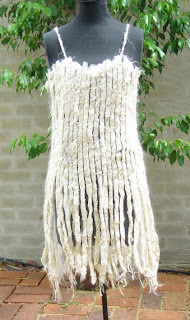 A lovely dummy - I am going to see if she will sell it to me - it's a beautiful shape for slim garments. and another close up. I needed some good shots to send off so Ian had fun even if he did have to stand outdoors in the heat! 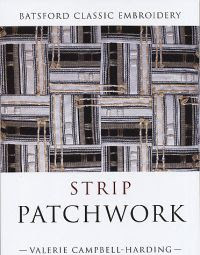 I have been rereading a few old favourites as part of my research - one I had forgotten about is Val C-H's Strip Patchwork. It's got so much useful information in it - I was amazed. Sort of ignored it a bit since the idea of patchwork doesn't grab me but, as always, Val has explored everything. We are off to dinner with Pam and Richard who have a b&b in Broome but at his time of the year they have escaped back to Perth. You couldn't say we have had much relief - it is just so muggy on day 1 and day 2 of 2008 and expected to be hotter tomorrow. 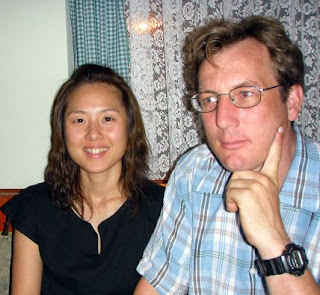 last night we went out to Koinonia Restaurant with Bruce and Kazuko and Grant came along later. This is a another fabulous eating house near us - we are very fortunate to have such wonderful dedicated chefs who are so interested in cooking and wine and like to talk to us. Kazuko wore her kimono for New Year's Day and she looked gorgeous. I am hoping Bruce has a pic for me. 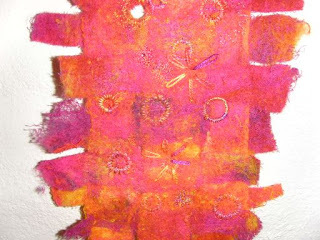 This is my last Applique on Net sample - time to move on to the next activity. 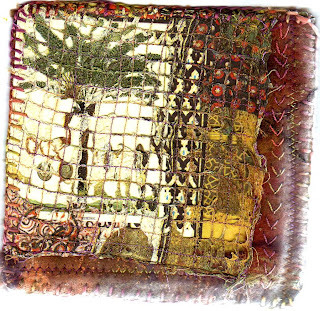 The net is some silk I bought from Fron Isaf a few years back and the applique some hessian removed from another piece. Happy New Year - 2008 has started nice and quietly in our neck of the woods and while it is hotting up, we have had a lovely relaxing day. I am proud that I have managed my NY resolution on day 1 by sending out the newsletter for January. You know I only write it - Ian does all the hard work of putting my stuff in semblance and adding pics and making it a pdf document. With a start like this, how could we go wrong? Last night we actually stayed up until midnight - watched the fireworks which we could see from our back garden. We only managed the first part of Gormenghast - not because we didn't want to see any more but the dvd jammed again - I shall take it back to Planet Video and see if they can fix it again. Otherwise I may have to read the books. Further to the applique on net - here is another - front and back. This one if a Romeo net with embellisher applique on top and and under applique if there is such a word. I rather liked the underneath side. It's hotting up again. I have finished reading a really good book 'A Year in Marrakech' by Peter Mayne. Written in 1952 but still very relevant.